The Count Sheet is the perfect tool for organizing any temporary or regular staff list. Gearing up for your organization’s busy season is no simple task. Your employees often stay longer hours and you might even hire a temporary workforce just to keep up with the demand. 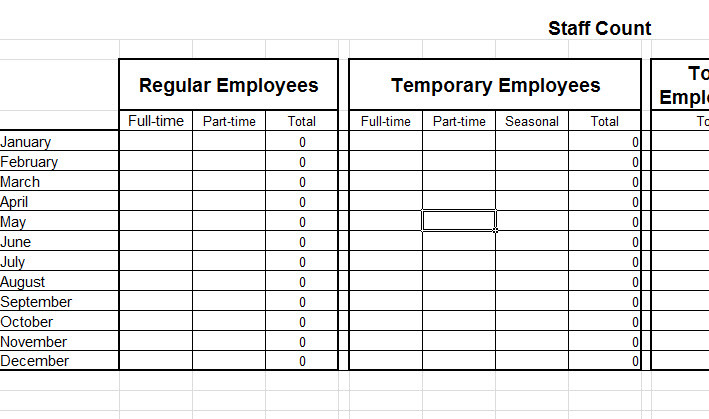 Luckily, this template helps you track both the total number of workers for each employment category and the total amount of hours they worked each month! You can begin customizing the Count Sheet once you have downloaded the free file below. The Staff Count template is designed to be simple and quick. You can efficiently enter your employee information by clicking in any of the cells and start typing the number associated with the column list. The structure is formatted to display the month you want to track on the left-hand side and the employment type listed in row 3. After you have entered the information into the document, the template will automatically calculate the total for each section. If you want to keep track of the total amount of hours your employees worked that month, simply enter the hours instead of the number of employees in each cell. The totals will help you keep track of the overall hours your staff is working and you can make sure your employees aren’t going to waste. After you have completed filling out the information you can print the Staff Count template to store for your records. Click on the “File” tab in the top-left corner of the document and select “Print”.